If you don’t have a smart TV, the Google Chromecast is a fantastic budget-friendly way to watch content from your favorite streaming platforms on the big screen, without the hassle of cables. This puck-shaped streaming dongle plugs right into the HDMI port at the back of your TV, with everything controlled via the apps on your smartphone, tablet, or laptop. One of the best apps available on Chromecast is Netflix, with its enormous range of original and syndicated TV shows and movies to get stuck into. With the Google Chromecast, you don’t have to worry about hooking up your laptop to your TV or login to your Netflix account with an irritating TV screen keyboard every time you want to catch up on the latest episode of RuPaul’s Drag Race. We’ve put together this handy guide with everything you need to know about watching Netflix with your Chromecast, so you can start streaming with minimal fuss. Which devices can I use to Chromecast Netflix? The Netflix app is available on iPhone, iPad, and iPod touch models that run iOS 7.0 or later, and can be downloaded for free from the App Store. If you’re an Android user, you’ll need a smartphone or tablet with Android 4.1 or later, and you can download it from the Google Play store. You can also run Netflix in the Chrome web browser on Windows, Mac, or Chromebook laptop and cast it to your TV using the Chromecast. You will need to buy a subscription to Netflix if you don’t have one already. Before you set up Netflix on your Chromecast, make sure your Netflix app is up to date; Android devices need to have the app version 2.4 or higher, while iOS devices must be running the app version 4.2 or higher. What resolution does Chromecast support? If you have a Google Chromecast, you’ll be able to stream Netflix in 1080p, but you’ll need a Chromecast Ultra if you want to stream in 4K. Streaming in 4K also requires a Premium subscription to Netflix, which costs $16 / £9.99 / AU$17.99 per month. If you’re not bothered about 4K streaming, you can get the standard package, which delivers the Full HD, 1080p streams for $13 / £7.99 / AU$13.99 per month, or the Basic package, which is only $9 / £5.99 / AU$9.99 per month, but doesn’t let you stream in HD. Firstly, you need to make sure your Chromecast device is connected to your TV and your Wi-Fi network. If you’re not sure how to do this, check out our article on how to use Chromecast and set it up on your devices, which walks you through the process. Once that’s done, open the Netflix app on your iOS or Android device, or alternatively, head to the Netflix website in your laptop’s Google Chrome browser. You should see a Cast icon in the upper right or lower right side of your screen (it looks like a little TV screen with a Wi-Fi bar in the bottom left corner) – click on this, and a list of available device will appear. Select your Chromecast from the list of devices, and the Netflix app will launch on your TV. Now you should be able to play any TV show or movie in the app and it will appear on your TV. If you’re unable to set up Netflix with your Chromecast, make sure that the Chromecast’s name doesn’t contain any special characters (for example, emojis or apostrophes), as this prevents the Netflix app from identifying it. You can change your Chromecast’s name by launching the Chromecast app on your device and selecting the name. 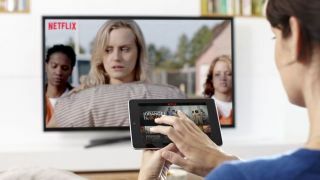 If that doesn’t solve the problem, it’s worth checking that you’re running the correct version of the Netflix app, as well as the most recent version of the Chrome browser or operating system on your mobile device. If you don’t see the Cast icon when you open the Netflix app, Netflix has released a number of troubleshooting steps you can follow to resolve the issue.